The network cabling team specialises in Data and Voice Cabling Solutions for businesses and the public sector. 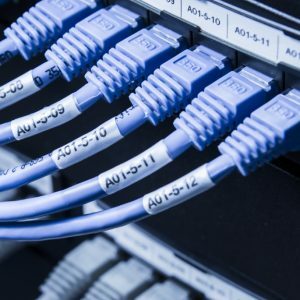 From a single outlet to a completely new installation, we offer a comprehensive, structured network cabling service that can support all of your data and voice networks. Services include the design, configuration, installation and implementation of all Data and Voice cable topologies, including Fibre Optics (single & multi-mode), Category 5 enhanced and Category 6, 6a & 7, Multicore Voice, as well as wireless laser link solutions. Installations are completed by ACS personnel who are fully trained and accredited in all areas of network cabling. All work is carried out in accordance with BS6701, BSEN50174, current IEEE regulations and CCITT standards with full test documentation and a 25-year quality guarantee. In addition, you will be provided with layout plans and numbering systems to ensure additions and alterations can be carried out effectively. For your server room, comms cabinet, or data centre, we can provide a variety of cable management solutions to help maximise performance of your network and keep a safe, tidy working environment. We can also remove and dispose of all data cabling as part of any office move, IT Relocation or dilapidation work. Trailing cables in the workplace are a risk to health & safety. ‘Spaghetti cabling’ in your comms room or data centre can reduce performance and cost you time and money when any changes are required. BBG IT Relocation can take the burden of these time consuming, yet important tasks for you.